Between Christ’s wanderings in the deserts of Jericho, and Kidder’s huddlings in the gardens of Glendale, there was Robert Sankey. Sankey, 44, a prominent Riverside contractor, was in a splendid mood September seventh last; he had no domestic or financial troubles, and bid his lovely wife and 13 year-old daughter goodbye that morning in his home at 270 Bandini Avenue before a trip to Laguna Beach. He made it to Laguna Beach, and picked up $12,000 ($132,359 USD2006) in cash which he had been paid by the Colton School Board for the construction of Colton High School. Sankey then told friends he was going for a swim, and left his bag, clothing, glasses and shoes at a hotel near the beach. From there he disappeared…the sea was dragged repeatedly for his body, but to no avail. Had the briny deep swallowed Sankey? And what became of the money? And what’s this?—a few days ago, some Sankey acquaintance came forth and reported having seen Sankey on a Seattle-bound boat a day or two after the disappearance. 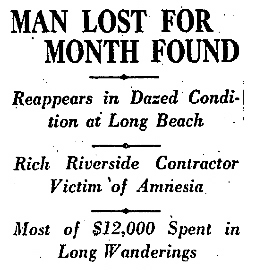 Today, Mrs. Paul McKenzie peered nervously through the window of her home at 4010 Massachusetts, Long Beach. There was a dazed, raggedy man wandering aimlessly up and down in front of her house for the better part of two hours. When she got up the nerve to confront the torn and tattered stranger, all a-jibber-jabberin’ to himself, it was, you guessed it, her brother, Robert Sankey. Oh no, he insisted, I’m Andrew Borg. Well, the Borg, I mean Sankey, had only $500 left (in checks issued by a Seattle bank) of the twelve grand, and even less of an idea as to where he’d been or what he’d done. He could only confirm that his clothes had been given to him by “the skipper,” and that he’d been to sea in a small boat with two men and a woman. Further investigation revealed that Sankey recently boarded the steamer Evanger at San Francisco (booking passage to Buenos Aires as “Andrew Borg, grain dealer, Witchita, Kan.”), but put ashore at San Pedro the day he reappeared in Long Beach. Sankey remains in his Borgian state at Seaside hospital, where Riverside county authorities are vexed with Seaside staff; the Sheriff is itching to serve two warrants on Sankey, each charging sixteen counts of violating the State wage law, but the pesky physicians demand that officers wait ‘til Sankey’s physical condition permits such activity. 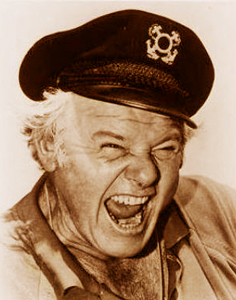 Whether amnesia or grift, please bear in mind…steer clear of small boats, and beware "the skipper." < Didn’t Read Her Wilfred Owen	> Let’s Call the Whole Thing Off!